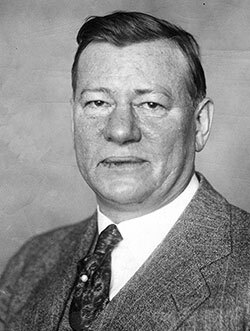 The Cleveland Touchdown Club Charities began its storied history in the spring of 1938 as a business venture started by the late Joe Fogg. Fogg invited some of his business associates to a luncheon at the old American Legion Hall to hear a guest speaker, Ray Ride, the football coach at Case Tech. After the third meeting, the twelve members decided to form a group called the Cleveland Touchdown Club and elected Fogg as the first president. They met for the next seven years on a weekly basis during the football season inviting the head coaches from “The Big Four” (Case Tech, Western Reserve, Baldwin-Wallace and John Carroll) to speak. As “The Big Four” faded into a memory, the Cleveland Rams/Browns took center stage at the weekly luncheons. The club opened its doors to the public in 1945 and formed a membership. In 1946, members of the Rams were invited to speak, and in 1948 the club sponsored a Football Awards Banquet at season’s end to recognize the accomplishments of football’s greats and near-greats from the professional ranks down through the collegiate, high school and municipal levels. Most of the awards continue to this day. The most prestigious award honoring the nation’s top college players is named after our founding member, Joe Fogg. The Fogg trophy winners are some of the finest football players in history. Among the many honorees are Syracuse’s Jim Brown; Navy’s Roger Staubach; Ohio State’s Archie Griffin, Eddie George and Orlando Pace; Purdue’s Bob Griese; Pittsburgh’s Tony Dorsett; Notre Dame’s Leon Hart and Joe Theisman; Michigan’s Jim Harbaugh and Desmond Howard; and Stanford’s Andrew Luck. This list is an honor roll unmatched anywhere. The Cleveland Touchdown Club has maintained a strong support group for professional football in Cleveland for over since 1938. The club flourished during the championship years of the Cleveland Rams, which won the National Football League crown in 1945. Afterward, the Cleveland Browns were created in 1946 and became the dominant team in the old All-America Football Conference until 1950. In 1964, the Browns upset favored Baltimore, 27-0, to win the NFL title. It was when the Browns joined the National Football League that the Cleveland Touchdown Club became the team’s official booster club. In the 1960’s and 1970’s, the Cleveland Touchdown Club developed further association with the Browns by sponsoring dinners that honored their Hall of Famers in addition to a gala affair honoring the Greatest Team Ever as voted upon by the fans. In the exciting 1980’s, the club undertook many charitable activities such as “Dream Come True”, an opportunity for special needs and economically disadvantaged youths to meet the Browns players. The club organized hospital visits in conjunction with the NFL Alumni Association and many more. In 1989, the club was recognized by SMACO (Sports Media of Cleveland and Ohio) with the prestigious “Tip of the Hat” award. The Touchdown Club membership flourished and activities with the Browns such as golf outings, bus trips to away games, Meet the Browns Nights and other enjoyable functions were added to the club’s format. The Touchdown Club also founded the annual Kickoff Luncheon, a civic event that welcomed the Browns at the beginning of each season, and sponsored retirement parties for such Browns greats as Warren Lahr, Lou Groza and others to end their seasons as players. However, in 1996, the Cleveland Touchdown Club was forced to regroup when the Browns left this great city in a devastating transition to Baltimore. With true grit, the club remained afloat and, in fact, grew stronger in its refocused commitment to “Providing Youth a Sporting Chance”. By 2001, The Cleveland Touchdown Club had fully transitioned its focus to charitable activities related to ensuring the safety of youth football players in our surrounding communities and providing high school seniors with scholarship opportunities to advance their education in ways that may not have previously been possible. At this time, Cleveland Touchdown Club officially became known as the Cleveland Touchdown Club Charities, Inc. Through the years the Cleveland Touchdown Club has sustained its mission through membership, generous friends and corporate sponsorships. While the Cleveland Browns have returned and new ownership has sponsored its own booster and charitable efforts via Cleveland Browns Charities, the CTCC has maintained its commitment to civic sports service and continued its charitable service in association with the Cleveland Browns Alumni. The CTCC has become a viable, recognizable and active civic sports organization on both the local and national level. We thank each and every one of you for the ongoing support of this great organization.